Problems getting an appointment with a GP have come into the spotlight once more. Five months after the prime minister was confronted on BBC One's Question Time programme by patients angry they could not book appointments in advance, a survey has found almost one third of people cannot book ahead. Virtually all GP practices have met the government's target that patients should be able to get an appointment for an urgent health problem within 48 hours. But doctors have said the target takes away their ability to accept appointments on clinical need, as they are forced to see both someone with a sore throat and an urgent cases within two days. The difficulties in booking advance appointments was first raised by Diana Church, a mother from Epping, Essex, on a Question Time in April, who surprised Tony Blair by telling him of the problems she had been having getting an advance appointment with her GP - even though the doctor had said her son needed a further check-up. The government has now said it will look at the issue of advance access as part of the public health white paper, due next year. Doctors have said they are pleased the government is considering such changes. Dr Mayur Lakhani, chairman of the Royal College of GPs, said the issue of access was a worry for doctors and the government, but particularly for patients - and he said flexibility around the target was the answer. "The basic problem is that there are not enough doctors, and there are spiralling workloads, so there aren't enough appointments to go around." But, as it takes seven years to train a GP - and therefore more doctors will not be available straight away - he said more immediate answers were needed. The 48-hour target was one way of improving access. Dr Lakhani said the target had been successful, but had distorted clinical priorities because patients with conditions which might have been designated non-urgent in the past have to be provided with immediate appointments under the new system. 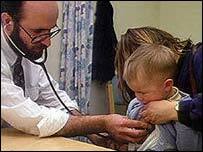 "Many doctors are seriously concerned about not being able to offer as many advance appointments as they would like. "One thing we need to look at is how access is measured, and therefore rewarded. "Maybe we should be asking if a patient who wants to see the GP next Wednesday is able to do so, as well as checking those who want urgent appointments can get them." He added: "At the moment, the incentive is for quick access - but maybe there needs to be a range of incentives. Faced with the prospect of losing money, a number of practices - up to one in five - initially stopped offering advanced bookings, although that number is believed to have fallen. Health Minister Lord Warner said there was no reason why GPs' contracts could not be amended to allow some flexibility in access targets. "There is no reason why we can't have a financial incentive which delivers both flexibility, and a response within 48 hours. "We don't want to throw the baby out with the bath-water. "We want to actually keep the urgent access, because that's what patients want, and that's what patients need. "We've just got to add some flexibility."